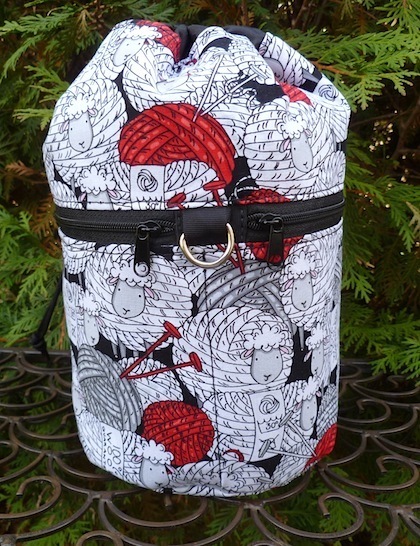 I have some customer comments that indicate my Kipster knitting bag is pretty good! See them at the end of this post. Years ago, when I first started selling online a customer asked me if I could make her a round drawstring bag to carry her golf balls. That bag, which I named after her using her nickname is the Suebee. I made the Suebee for a few years and customers found many uses for it. (They still do, stay tuned for a post about the oh so useful Suebee!) Another customer found it and asked if I could add some features to it so that it could be used as a knitting bag with pockets. She told me she liked to knit while walking and wanted a bag she could use for that purpose. Knit while walking? This was fascinating, I had no idea people were doing that. I learned there was a movement called knitting in public and there was even a day to celebrate it each year. That bag became the Kipster, a design that makes me proud. I upgraded the lining of the Suebee to a heavier packcloth in silver gray so you can see the contents easily. Inside I put a variety of pocket widths for knitting needles and other equipment. On the outside I designed two zippered pockets that wrap around the bag. In between the pockets, at the front, I added a d-ring. The idea with this is two-fold, it gives you a place to hold while unzipping a pocket, but it also provides a place to attach a tool, perhaps a pair of scissors that you can keep in the pocket. Since this bag is great for travel the last thing you want to do is leave your scissors sitting on the table at the dentist’s office while you are waiting to get a filling! The final touch was a way to allow this bag to be carried hands free if so desired. A key ring at the top back seemed to add the most versatility. You can use it to simply grab the bag if you are at home, but if you are traveling you could add a carabiner so that you can clip it to another bag, a wristlet strap, a unique shoulder strap with one clip, or a double clip strap that is long enough to go across your body or around your waist as a belt bag. Since I use a key clip and not a simple ring, you can even add tools to it if you wish. 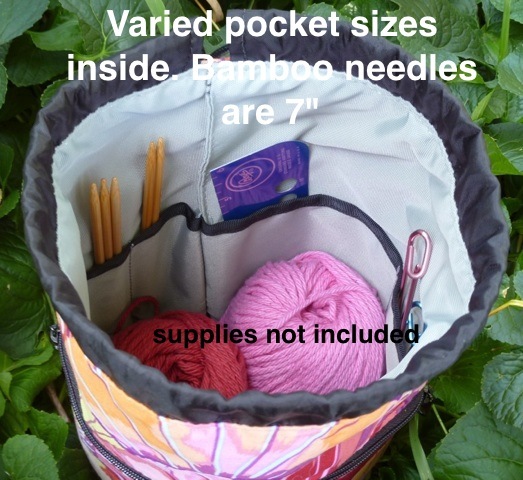 A variety of pockets inside and out, give you storage spots for a phone and wallet so you can take your knitting on the go and have everything you need. 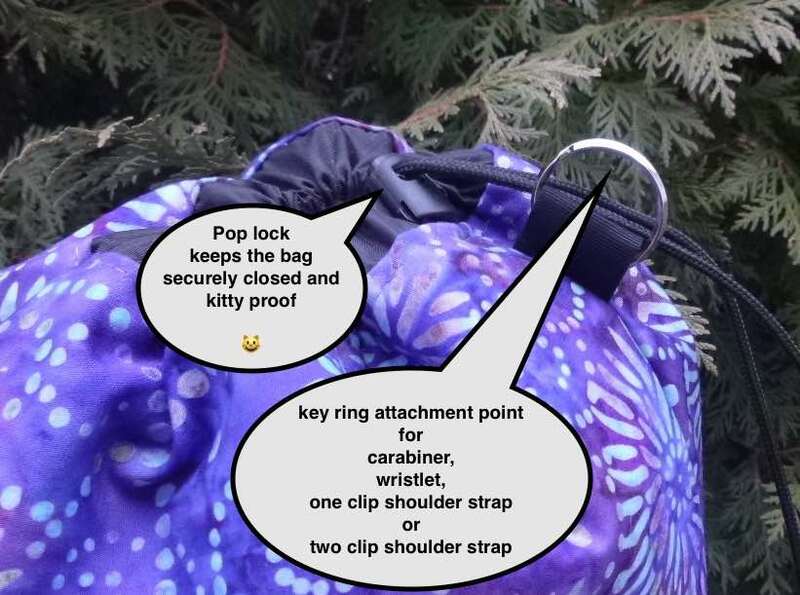 The bag is designed to stand up nicely on its own, and the drawstring has a cord lock to keep the contents secure from that kitty of yours. Your yarn feeds out through the top very easily too. 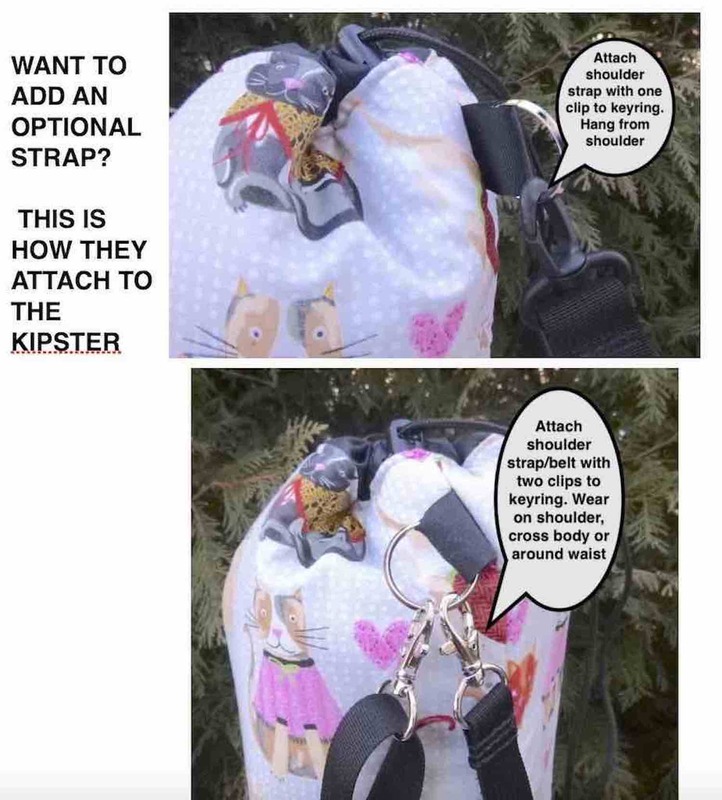 Remember the Kipster came to be because of a customer request? This is the feedback I received from that very first owner. “Your work is excellent. I couldn’t find anything that even made me go “Hmmm” on close examination and three days living with it. 1) Suebee and Kipster drawstring style bags are large enough to fit socks, shawls, and I’ve even carried my spindle and some fiber in them. 2) the lining fabric is smooth, so if you want to carry your spinning, the fiber won’t get caught on it! 3) For those who “cake” their yarn on a ballwinder… the cake fits perfectly on the round bottom. Hi Karen – I’ve gone through at least 5 knitting bags, some costing a LOT of money (as in over 150), and the Kipster is hands-down the best. As some of your reviews say, the Kipster holds a cake of yarn, or two, perfectly. 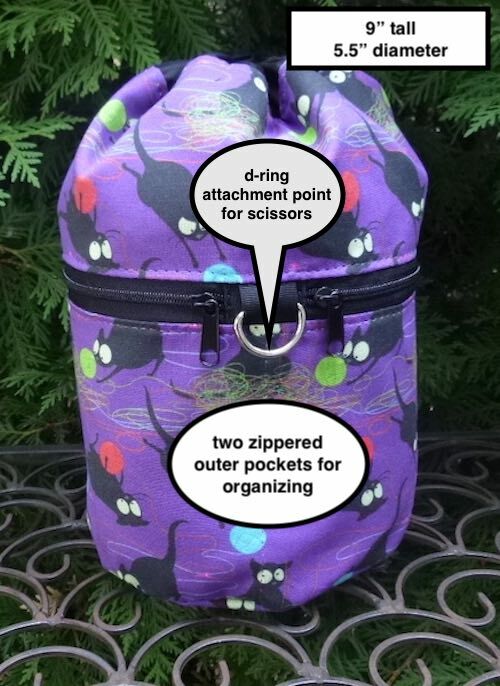 All of the pockets are well-placed and handy sizes to hold everything, the zippers and rings on the outside are far more useful than one might first expect, and there is NO VELCRO, which is a huge, huge deal. They are finished so well that I have never had a yarn snag on anything. I use mine even when I take the huge sweater-project bag, because all the tools are so much easier to get to inside the Kipster, and the yarn can’t escape and cause problems. I’m sure more knitters would love the chance to buy one!